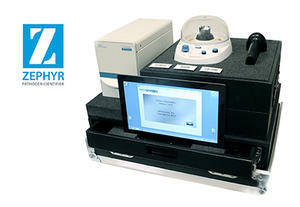 Baltimore, Maryland-based PathSensors, Inc. has introduced the portable Zephyr Pathogen Identifier system. The company says it delivers rapid, reliable detection of bacteria, virus, and toxins in powder and liquid samples in minutes. The Zephyr Identifier uses CANARY (Cellular Analysis and Notification of Antigen Risks and Yields) technology, which is licensed from the MIT-Lincoln Laboratory. Baltimore, Maryland-based PathSensors, Inc., an environmental testing bioscience company, has introduced the portable Zephyr Pathogen Identifier system. The company says it delivers rapid, reliable detection of bacteria, virus, and toxins in powder and liquid samples in minutes. The Zephyr Identifier uses CANARY (Cellular Analysis and Notification of Antigen Risks and Yields) technology, which is licensed from the MIT-Lincoln Laboratory. With CANARY biosensors, the rapid kinetics and signal amplification of cell-based signaling enables pathogen detection at sensitivities down to 50 cfu/pfu within five minutes. Zephyr detects foodborne pathogens such as salmonella, E.coli, listeria, and campylobacter in dry foods, meats, and on food preparation surfaces — things which are significant issues for food producers. The company says that currently it is engaged in programs with the USDA and FDA to identify pathogens in poultry and plant materials. The company notes that at launch, it is offering reagents for rapid identification of the most common bio-threat agents. Initially, these pathogens include anthrax, ricin, botulinium toxin, smallpox, the plague, and tularemia. The new Zephyr system expands PathSensors’ line of instrumentation which includes the BioFlash-AF Identifier for aerosol collection and identification of airborne pathogens in the ag-poultry environment, using a single sample. PathSensors says it now offers a complete line of instrumentation that can identify biological agents in any sample matrix: powder, liquid, or aerosol. The instruments can be used as standalone or as part of an integrated biological detection system. The existing product line also includes the BioFlash-E Biological Identifier, a high-volume aerosol sampler for building, event, and mailroom applications.